Home / Articles / How does an Electric Motor work? An electric motor is a machine which is powered by a three phase A.C supply which is converted into a mechanical force. The electric motor specifically generates rotary motion. This rotary motion can drive a shaft on which mechanical elements can be driven such as a conveyor belt or shredding machines. So how does an electric motor work? Within an electric motor strands of copper wire called the windings are tightly wrapped around magnets, called the stator. These magnets have different poles which attract and repel the electrons within the windings. The effect of introducing a power source to the copper wire excites the electron flow and causes the electro-magnetic force to generate. 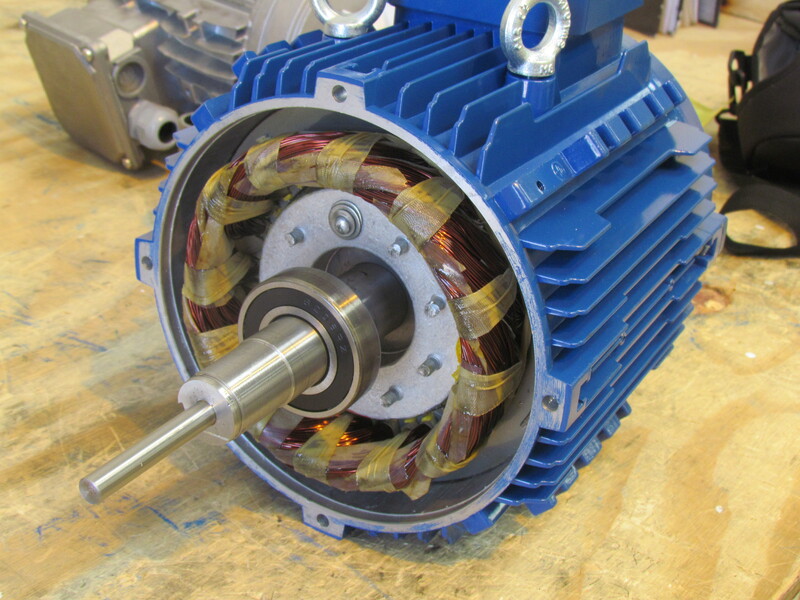 There are three main components to an electric motor. In an electric motor the moving part is called the rotor which turns the shaft to deliver the mechanical power. The rotor usually has conductors which carry currents that interact with the magnetic field of the stator to generate the forces that turn the shaft. Electric motors are used to produce rotary force known as torque. Around the rotor within an electric motor there is what’s known as the Stator. This is a stationary part of the electromagnetic circuit. The Stator is made up of many metallic sheets which are called laminations which are pressed together to make what is known as, the stator core. The purpose of which are to reduce the energy lost compared to using a solid core; using these laminations in this way results in a more efficient motor. As the stator is excited, an e.m.f is produced. The electric magnetic field rotates and the force is then induced onto the conductive parts of the rotor. The yoke is what the stator and rotor are both enclosed inside of. Not only does this provide protection for the internal parts, but the yoke has little fins on the outside which help disperse the heat generated from the motor.